It’s time for another round-up, the last one was soup and that was months ago! Well, this one is all about the snacks – nutty, raw and often chocolatey. I thought of this the other afternoon when I had just three Brazil nuts in my bag. Now I have nothing against Brazil nuts. Indeed I really love them – full of magnesium which we often don’t get enough of and essential for good health. But I have taken to having my Brazil nuts with a couple of squares of my favourite Green and Blacks 85% Dark Organic Chocolate. But I’d run out the night before and so I just had the three sad (but large) nuts. Nice but well, just nuts. So that led me to start thinking that I need to make something a little more tasty and that lead me to thinking about a round-up. Get them all in one place instead of all over the blog! Raw bars, don’t you love them? They are so tasty, yummy nutty little numbers that are just the right size for that wee bite or two of flavour. A pure energy pick up that is healthy and so guilt free. To make it all super easy, I’ve gathered all my raw bars and bliss balls in one post. And I am so good that you don’t need to pop out to each page, but can print them all off from here. No need to search all of Paleo with cream looking for them, handy! Now shall go I polish my halo??? First up are these delicious three ingredient recipe are from my primal hero Mark Sisson over at Marks Daily Apple – Dark Chocolate & Citrus Macadamia Balls. Nuts, chocoalte and the surprising zing of orange zest! Blend the macadamia nuts and salt in a food processor just until the nuts are smooth and have the consistency of dough. Stop processing before the nuts take on a looser, butter-like texture. Set the macadamia dough aside and wipe the food processor out. Blend the chocolate chips until they are broken into tiny pieces, similar to chocolate sprinkles. Shape the macadamia dough into balls. If the dough isn’t holding its shape, refrigerate it for 30 minutes first. 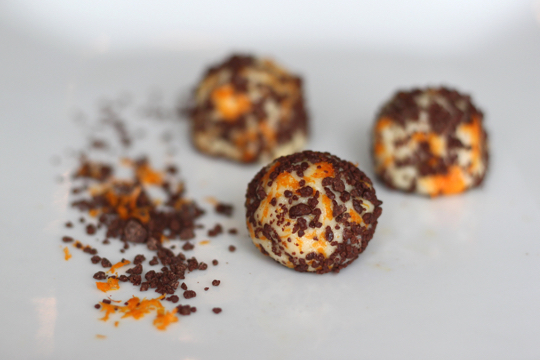 Roll each ball in orange zest, then chocolate. Store in the refrigerator. Read more at Marks Daily Apple. Nutty Chocolate Raw Bars. Just posted the other week. 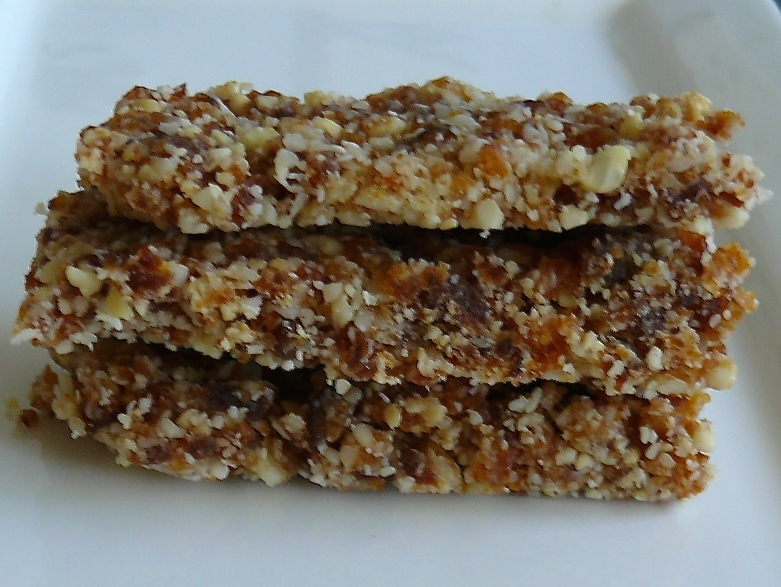 Coconut and coconut oil, plus two types of nuts make up these raw bars. And if you don’t like the shape, then roll them into balls. I haven’t tried these dipped in melted chocolate, but I think that could we an awesome refinement! 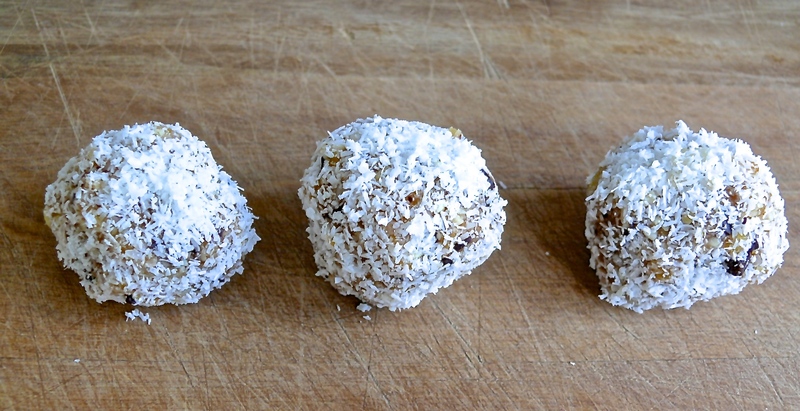 Chocolate Macadamia & Coconut Bliss Balls, well there is nothing complicated about these. Try swapping out the Macadamia nuts for say Pecans and see what happens. Well that could be another bliss ball post coming up! You can see I do have a thing about coconut! Nutty Apricot Coconut Balls rolled in desiccated coconut, they could be just as tasty rolled in chopped pistachios or grated chocolate! 3/4 cup dried Apricots – – read the ingredient list on the packet as some brands add extras. • Shape balls and roll in the extra coconut. Chocolate Hazelnut Balls, so I can’t claim the fame for these balls either. You’ll know exactly what these balls are a copy of, if I had wrapped them in gold foil. Thanks to Caroline O’Fee for creating them. Coconut Chocolate Squares. Very similar tasting to Bounty bars these are my favourite chocolate coated bars or squares. They taste great without the chocolate coating too! Soak prepared dates in water for at least 20 minutes to soften. Continue to process until well combined – you may need to scrape the sides down a couple of times. Remove from processor and shape into a large square, place this onto a tray then cut into smaller squares. Or if you prefer round truffle shapes instead then roll the mixture into balls. Place in the fridge for at least two hours, then place in the freezer for 30 minutes. Break chocolate into a bowl and microwave on medium high a minute at a time, stirring each time. 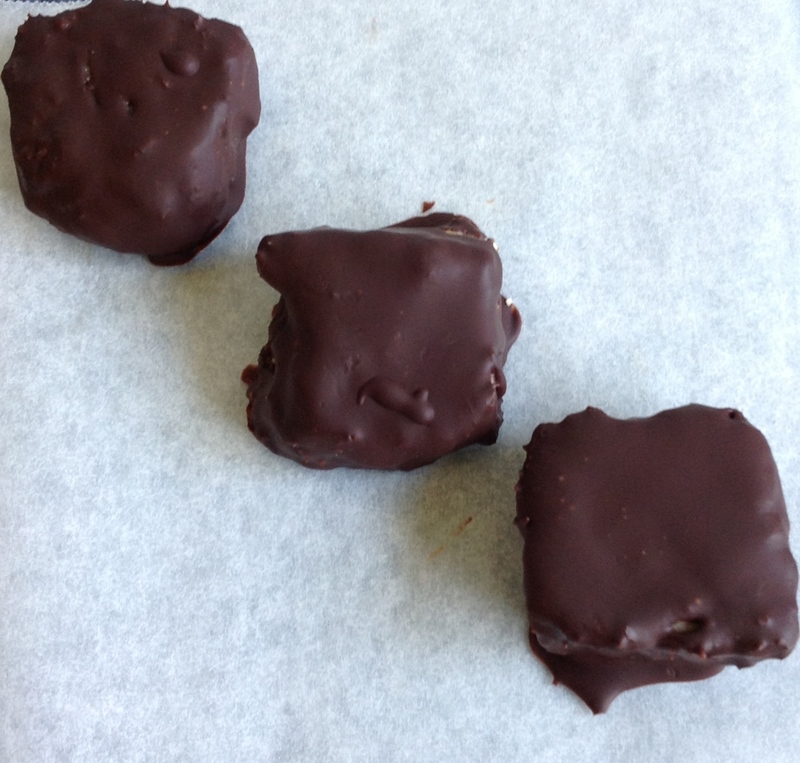 Once melted dip each cold coconut square into the chocolate using two forks. Place onto cooking/parchment paper to set. Finally the last in this round up is one of the most popular. Macadamia, Cashew & Apricot Bars – make them long or roll them up. Super tasty! Well that’s it! I hope these inspire you to make your own raw bars. Who would want to buy yukky processed bars full of unreadable ingredients when you can have your very own home-made with only a little effort and a good food processor! Awesome list of quick recipes! Love trying out new raw snacks. Thanks!